I'm so incredibly happy to have a week off work this week. We're currently having a big refurbishment in work which has meant lots of lifting, moving books and setting up a new issue desk and I'm exhausted. Me and my boyfriend are heading to West Wales for a few days and I'm really looking forward to relaxing on the beach, having a BBQ, doing plenty of walking along the Pembrokeshire coastal path and just getting away from it all. I spent a lot of time in this area as a child and always had a week break in Tenby at the start of the summer holiday before we headed abroad for our main holiday later in the summer. I'm going to be camping next to Monkstone Beach which is roughly midway between Saundersfoot and Tenby. You can only access it through our campsite so I'm hoping it's going to be pretty quiet and relaxing. "Broadhavensouth" by JKMMX - Own work. Licensed under CC BY-SA 3.0 via Wikimedia Commons. "Tenby Wales UK" by Saffron Blaze - Own work. Via Wikimedia Commons. I haven't been on a seaside holiday in the summer for years so I really need to stock up on some essentials before I head off. I'm being very optimistic buy taking swimwear but the forecast is good and I'll be taking a waterproof jacket in case there is a little shower when I go walking. I won't be back until the end of the week so see you all soon! I know how exhausting work can be. With the weather set to be fine, you should have a great relaxing time. The spot looks wonderful What fantastic photos. Monkstone Beach looks amazing as does your wish list. Would recomend some Jelly shoes with glitter. 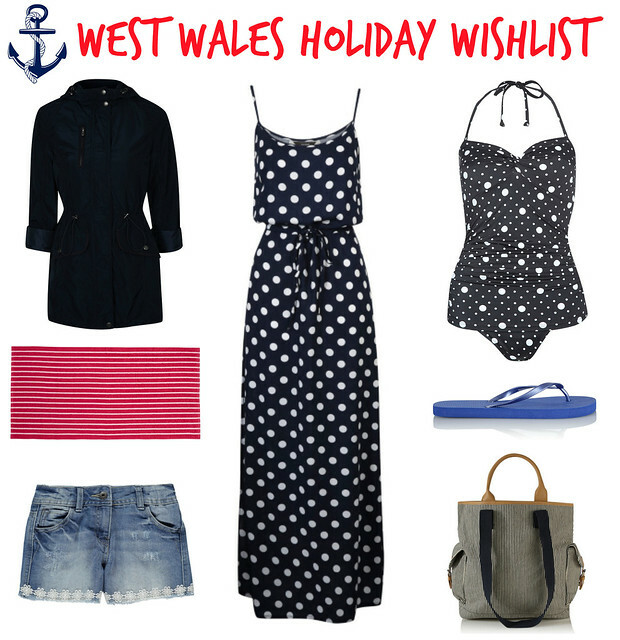 Perfect for pottering around beaches. Fingers crossed the weather stays good. Aaah it looks beautiful! I really miss going to Wales on holiday! Oh look at those beautiful seaside colours. I thinK I want to live by the sea one day!